If there is a debate in the new Congress in 2009 about comprehensive health reform legislation, a major question is: Will there be an appetite for a bipartisan, centrist deal? No matter who is in the White House or what the margins are in the Senate, it is very unlikely that the deep divisions about how to reform our health care system between left and right will have been transformed enough to support passage of legislation that will entirely satisfy either liberals or conservatives. Health care’s ideological divide is too deep. 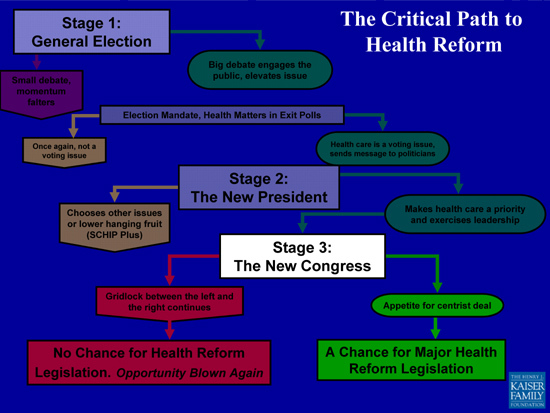 It will therefore take a compromise somewhere in the middle, shading left if there is a Democratic president or more right if there is a Republican one, to get legislation passed, but there will be a centrist compromise or no compromise at all on health reform in 2009. Of course other challenges will present themselves as well. Health care’s famous interest groups will become active in the process. And the challenge of paying for expanding coverage, always a major hurdle, will be exacerbated by the pressure to balance the budget in what may still be a shaky or recovering economy.